So, you have been having some stomach issues. Maybe you’ve been diagnosed with IBS and have SIBO. Or maybe you’re just searching for some bloating and constipation relief. 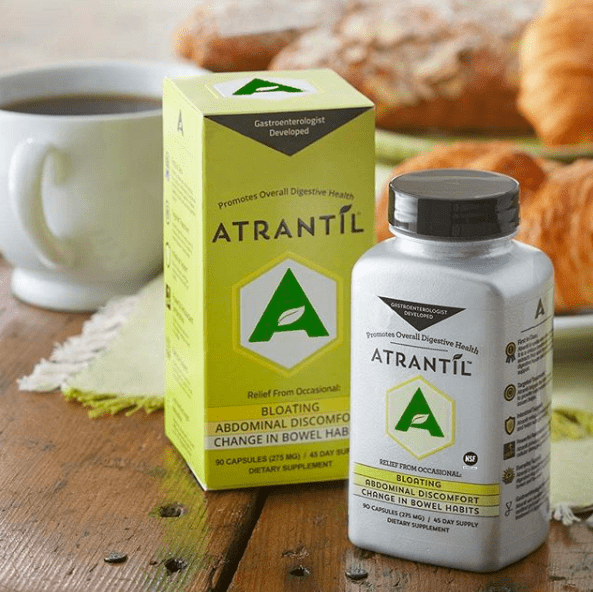 In this article we will review the product called Atrantil, which was developed by a top gastroenterologist who understands IBS, SIBO, bloating, and stomach issues very well. He designed Atrantil to help patients with these symptoms in a natural way. In this article we will go over what Atrantil is, the ingredients used in Atrantil and how they work, some clinical study results using the product, how Atrantil can be used for SIBO and IBS, and any side effects you should be aware of when trying Atrantil. 7 Where to Buy Atrantil? 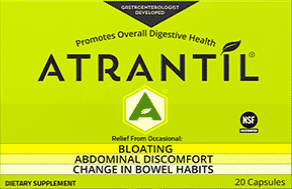 Atrantil is a natural remedy that has been proven to dramatically reduce the abdominal discomfort, bloating or changes in bowel habits that an individual may experience throughout their life 1. In fact, Atrantil has been shown to successfully improve these symptoms in 1 out of every 5 people who try this natural and safe treatment option. Each of the ingredients in Atrantil has been carefully selected for their separate beneficial effects that have been shown to dramatically improve these symptoms for many people around the world. Each ingredient of Atrantil is a natural polyphenol that works specifically in the small intestine to reduce the presence of methane-producing bacteria. Once these ingredients are used up in the small intestine, they move on to the large intestine to be broken down into beneficial compounds that act as prebiotics within the GI tract. See Figure 1 for a breakdown of each chemical ingredient of Atrantil and exactly how this natural remedy exerts its beneficial effects on digestion. In addition to the ingredients listed in Figure 1, Atrantil will also contain microcrystalline, cellulose, vegetable gelatin, magnesium stearate and silicon dioxide. Figure 1: Ingredients of Atrantil and their health benefits. The use of Atrantil in the treatment of both SIBO and IBS has been greatly supported through a number of clinical studies. As shown in Table 1, these clinical studies illustrate exactly how Atrantil has exhibited its beneficial effects for patients suffering from a variety of digestive disorders. Table 1: Atrantil in clinical studies. Small intestinal bacterial overgrowth (SIBO) and irritable bowel syndrome (IBS) are two of the most common digestive disorders that people all around the world deal with every day. Despite their prevalence, physicians still have tremendous difficulty in adequately treating these disorders in a way that goes beyond just symptomatic treatment. The most advantageous perk of Atrantil’s mechanism of action involves its ability to directly eliminate the bacterial species that allow for gases like hydrogen (H2) and methane (CH4) to proliferate throughout your GI tract. Using herbal formulations like Atrantil can be very effective. To see the other herbal options used in SIBO see this guide. Thousands of consumers have already experienced the benefits of Atrantil. See below for some of the highlighted customer reviews for Atrantil that have been posted on their site. Each of the clinical studies that have investigated the beneficial use of Atrantil on treating IBS-C did not find that patients experienced any adverse side effects to this natural remedy. While this is true, some people who have taken Atrantil have experienced some minimal side effects of which include muscle ache, foggy head, headache, etc. These results are believed to be positive effects of Atrantil successfully removing the problematic bacteria from the body. Physicians who have prescribed Atrantil claim that a small percentage of patients may need to feel worse before they feel better; meaning that while these initial adverse effects may be uncomfortable, they are the body’s way of removing toxins and purifying the GI tract for improved function in the future 6. Atrantil can be purchased directly through the company. This is the best way to purchase Atrantil because you will get the product quickly from the supplier and ensure that it is the highest quality. Use the coupon code SIBO10 at checkout for 10% off. Hi Josh, what a great summary and interview with Dr. Brown! It seems like Atrantil could be a long term strategy for preventing methane overgrowth. On Atrantil, would a concurrent prokinetic still be the suggested protocol to resolve the root cause? It would really just depend on your health history and situation. Sometimes prokinetics are not used and sometimes doctors suggest them following a protocol or alongside one. You would have to check with a doctor for that question. What I can say is that you can definitely try a natural prokinetic alongside Atrantil just make sure to monitor both of them separately to see what helps.